SCOPE mouthwash gives long-lasting fresh breath! This is a Sponsored post written by me on behalf of SCOPE. All opinions are 100% mine. 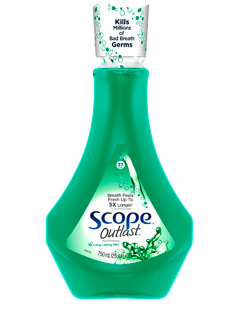 When I was younger, my mom always used Scope mouthwash. She would even buy travel sizes to take with us on family vacations! I have never really been big on mouthwash, but just last week I was at the dentist, and she suggested that I keep mouthwash in my desk at work to use mid-day if I’m not able to brush. My free sample of SCOPE mouthwash arrived just in time! The last time I used mouthwash was several years ago (probably when I was single and in my “dating” phase), and it was very strong and overwhelming, so I was expecting the same from SCOPE when I tried it, but I was pleasantly surprised! It was not overpowering, but was refreshing! That clean and refreshing feel lasted much longer that I expected and I didn’t even need my afternoon gum fix! I love that I can be confident and have fresh breath even when I’m on the go and I’ll definitely be keeping some at work with me! With Valentine’s Day just around the corner, you want to have kissable fresh breath, and Scope is the perfect pick! It’s available at your local Walmart store in 3 flavors including Outlast, Dual Blast, and Classic. The Outlast lasts up to five times longer than brushing, the dual blast is perfect for getting rid of bad breath from garlic and onions, and the classic version kills 99% of bad breath germs! Find out more about Scope here–> Fresh breath & courage, 1 oz at a time!